Imphal, Jan. 17: The first birth anniversary of renowned playwright, director and actor, Padma Bhushan awardee Heisnam Kanhailal was observed today at Maharaj Chandrakirti Auditorium, Palace Compound, Imphal. The observation will be held for three days i.e., from 17th – 19th January, 2018 and is being organised by Kalakshetra Manipur in collaboration with Sangeet Natak Akademi, New Delhi, Department of Art & Culture, Government of Manipur and Jawaharlal Nehru Manipur Dance Academy. Speaking as the Chief Guest at the inaugural function, Governor, Dr. Najma Heptulla said that literature and theatre are truly indicative of the society and their studies provide not only a cultural and traditional glimpse of that society but also reflect its vast multi layered identity. Theatre brings out the traditional richness and beauty of the people in a society through the language of the common and unassuming people. She added that theatre, like other art forms, aims at propagating and reinforcing deep-rooted principles related to the religious and ethical life of the people. And yet the same art forms can serve just as effectively as instruments of change, adjusting messages to suit new sets of realities and changing value systems. She further said theatre can be thought provoking and a strong catalyst for change as evident in the Kanhailal’s genre. Preservation and sustenance of a Nation’s identity and heritage are the fundamental duty of a citizen. She expressed hope that through the medium of theatre the traditional amity, national unity and harmony will be reinforced apart from providing entertainment to the people. Manipur being a culturally rich state, there are ample scopes for extensive works and research in the field of theatre and Kanhailal occupies the pole position as a torch bearer, she added. 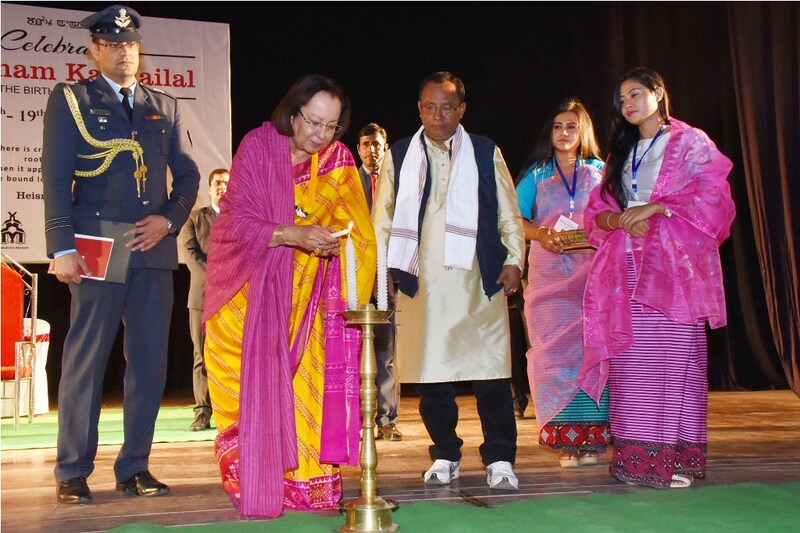 Lauding the works of Late H. Kanhailal, the founder-director of Kalakshetra Manipur, she said that he dedicated his life doing research on native theatre, responding to the contemporary socio-political turmoil. She also said his invaluable contribution in making Manipuri theatre known to the world with his innovative creation of a new medium in the tradition of psycho-physical acting must be acknowledged by every citizen. He is the lone theatre practitioner in the contemporary Indian theatre who provided theoretical and practical knowledge of his own individualised theatre which caught the attention of theatre practitioners and researchers across the globe. She said that the observation will foster the Manipuri theatre in its pristine purity and to further develop and consolidate the composite Manipuri culture by carrying forward the legacy of Heisnam Kanhailal. The celebration which will be marked by memorial lectures, discussions, and three theatre shows of his direction namely, Tamna Lai (1972), Pebet (1975) and Dakhgar (2006), will highlight the historical milestones of Kanhailal’s theatre journey. The memorial lectures scheduled as a part of the celebration will also mark the beginning of a critical engagement for Kanhailal’s works. Governor said she is happy to learn that the theatre group has been sharing a substantial role in the growth of his genre of theatre. It is heartening that Kalakshetra Manipur believes in the notion of a workshop that is a laboratory or a research theatre open to critical engagement as well. It is a remarkable journey that the group has produced 20 plays since inception including several outstanding plays directed by Kanhailal, she added. President of the function Health Minister L. Jayentakumar expressed his happiness over the Governors’ keen interest to promote Nat Sanskirtan in the State. He said that from his association with the Late H. Kanhailal, he learnt how to interact with the people, and increased his inquisitiveness in observing the surroundings. Late H. Kanhailal himself is an institution in the theatrical movement and discussing on his life and concept is not a simple task but needs to be learnt by the aspiring scholars in the field. His life as a whole needs to be discussed to know his place in the theatrical field. He further said that he will try to involve the department in observing the Golden Jubilee of Kalakshetra Manipur next year in a grandeur way. In his memorial speech Professor N. Tombi Singh recounted the life events of late H. Kanhailal in becoming one of the renowned theatre personality with determination and dedication after facing many challenges. A souvenir was also released in memory of Heisnam Kanhailal by the Chief Guest and the President of the function. The inaugural function was attended by theatre personalities and many art lovers of the State.